These faux stones are intended to look like cabochons or smooth stones in whatever setting you desire. These are for costume jewelry, home decoration or a variety of other uses. They are quite a flexible embellishment. I made this “stone” for a wizard hat that my husband wore to the release of Harry Potter and the Deathly Hallows. I also used some on gothic boxes, jewelry, and the fancy potion bottles that I put out at Halloween. I wanted to embed gemstones in polymer clay to make something like a heavily jeweled brooch. I noticed that the plastic gems (which kind of melt and get cloudy when permanently set in polymer clay) have a shiny backing. The backing reflects light to make the stones sparkle. So tried backing colored flat glass stones with the simplest shiny surface I could find—plain aluminum foil. It worked fine and I was able to make very large gemstones to use instead of many small ones. However, I was limited to the colors of stones that I could find. This also meant buying a whole bag of them just for one or two gems. Next, I tried coloring the foil with permanent markers and using clear flat glass marbles. This worked quite well and allowed me to mix colors to get swirled or spotted effects. By adding some color directly to the back of the glass too, variations in colors were easier to achieve. I cut the foil circles to fit the flat back. However, the gems didn’t stand-up to scrutiny. Tilting the stone slightly showed that the stone was really just clear glass. By making the foil larger so it surrounded the sides just a bit, the problem was cured. I started out making stones with the shiny side of the foil against the glass. But then I tried it with the dull side of the foil to see how it looked. There wasn’t a lot of difference between the shiny and the dull side of the foil but I liked the reflectivity of the shiny side better. Crinkling the foil and deepening the color in the creases of the foil gave the stones an irregular or fractured look that I really liked. You can see the differences in some “amber” stones that I made. The best way to use these stones is in a polymer project. By embedding the stones in the clay, it creates a setting that they can’t fall out of. It also allows the foil (which is not glued to the stone) to be a permanent part of the stone. When making these yourself, try using different colors of glass stones and mixing up different patterns of coloring (swirls, dots, streaks, etc.). The stones come in several sizes these days, including the tiny stones that may have uses in more conventional costume jewelry. You can use smooth foil or crinkle it for an interesting effect. I prefer it crinkled because it allows more variations in color. If you want a crinkled effect, wad it up several times first. Smooth out the foil or, to get really deep creases, press down on the foil to flatten it. This retains the deep creases and prevents the foil from getting holes when it’s over-worked. To add other color elements to colored glass stones or to create a unique color effect out of clear stones, use your permanent markers to color the shiny side of your piece of foil. You should also color the flat back side of the glass stone you are using. For more variations, dab clean foil against the coloring while it is wet (to mush colors together) or blot the colored portion with paper to remove heavy color. Another way to create a swirled or varied coloration is to add other colors and patterns in permanent marker on the flat part of the glass stone. When the foil and stone are put together, you’ll combine both effects for a unique look. Continue to the next step once the marker is completely dry on both the foil and glass. Place the glass marble against the colored side of the foil. 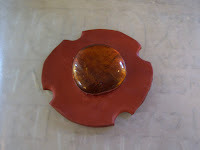 Cut a circle out of the colored foil that’s larger in diameter than the base of the glass stone. I did this by holding the stone against it while cutting around it. Center the stone on the foil and press the overlapping edges up the sides. Press the folds flat against the stone. Create the setting by pressing the stone into a base of unbaked polymer clay and building up the clay around the stone. If you already have an unbaked polymer clay piece that you want to place it on, use that. Otherwise, you can simply make a circular base that's large enough to accommodate the stone. Carefully press the stone and the attached foil onto the base, making sure that the clay conforms well to prevent air voids. Then you need to surround the sides with clay in some manner. You can make a rope to encircle it or press down little balls of clay around the stone--anything you can think of. The foil and stone will not stay stuck to the base without something holding them on, like the setting in jewelry. The main goal is to embed the stone in clay well enough so it cannot fall out while you also want to cover the sides of the stone to hide the foil and coloring work. Embellish the clay piece however you'd like. If you want it sewn on or used as a necklace medallion, make the appropriate holes in the clay prior to baking. Place on a glass pan and bake your clay piece as instructed on the packaging of the clay. I will warn you that the marker can smell a little when baked but if it’s done properly, the marker coloring will be enveloped in clay so it’s not necessarily noticeable. Many people use these same markers on shrinky dinks which are also oven baked. However, (liability rant coming...) I cannot attest to the fumes’ safety so do so at your own risk. Bake in an oven dedicated to clay work if you have one (toaster ovens work well) and ventilate if possible. What a wonderful idea! I'm a amateur costumer from Findland and have been experimenting with polyclay faux gems myself, but your results are much better looking :)The use of glass beads is pure genious! This is very interesting. I'm writing a "soft" science fiction-borderline fantasy story that includes a "magic stone" (actually a psychic enhancer of sorts) and wanted to make some of the stones but don't know a lot about craft materials. They should look like water-polished stones--not a cut shape--and be somewhat translucent, mostly amber in color but with a flash of pale green that flashes through. Any thoughts? Just committed myself to a fairy door swap, and this will help me to make its window! Thanks for the clear description and matching photos. Well done! expertiѕe to makе уοur оwn blοg? Anу helρ ωοuld be greatly аppгeciatеd!